News is updated bi-weekly or more often below. Springtime in an HOA March 08th, 2019: Springtime is about to………. Get ready to enjoy the sunlight, but along with the beautiful weather we all have more responsibilities as landscape comes out of dormancy and we are greeted with mother nature’s confetti as the pollen covers all of our belongings. Your Legend Oaks III Homeowners Association would like to let you know what will be taken ... Read more about this. Legend Oaks 3 – Yard of the Month December 27th, 2018: I am pleased to announce that the Legend Oaks 3 Association has continued Yard of the Month for 2018. During the months of May, June and July members of the Board will select the most well maintained yard in the community. Winners will be awarded a $50 gift card to Lowes. During the month of December ... Read more about this. Storm Clean Up October 11th, 2018: Please keep in mind we are seeing a lot of wind-blown debris and this will likely be second priority for all landscape companies to remove. It will be as much as 7 to 10 days before everything is tidy and back to normal. It is possible there may be charges for extra clean up unless it’s ... Read more about this. Community Yard Sale September 24th, 2018: Legend Oaks Community Yard Sale Saturday, September 29th 7:00 am until 12:00 pm Read more about this. Yard of the Month August 29th, 2018: I am pleased to announce that the Legend Oaks 3 Association has continued Yard of the Month for 2018. During the months of May, June and July members of the Board will select the most well maintained yard in the community. Winners will be awarded a $50 gift card to Lowes. During the month of December ... Read more about this. Yard of the Month July 30th, 2018: I am pleased to announce that the Legend Oaks 3 Association has continued Yard of the Month for 2018. During the months of May, June and July members of the Board will select the most well maintained yard in the community. Winners will be awarded a $50 gift card to Lowes. During the month of December ... Read more about this. Yard of the Month June 20th, 2018: I am pleased to announce that the Legend Oaks 3 Association has continued Yard of the Month for 2018. During the months of May, June and July members of the Board will select the most well maintained yard in the community. Winners will be awarded a $50 gift card to Lowes. During the month of December ... Read more about this. Legend Oaks III 2018 Annual Meeting March 08th, 2018: Dear Legend Oaks III Homeowners, The Legend Oaks III Homeowners Association Annual Meeting will be held March 20, 2018 at 6:30 pm located at Beech Hill Elementary, 1001 Beech Hill Road, Summerville, SC 29485. In order to meet quorum, the Association needs everyone to complete the proxy form, even if you plan to attend. This will ... Read more about this. Entrance Lighting Enhancements February 21st, 2018: Hello Residents! Your Board of Directors would like to inform you all they have approved new entrance lighting enhancements to be installed tomorrow, February 22nd, weather permitting. If you have any questions, please do not hesitate to reach out to CMG. Thank you! Read more about this. Fall Cleanup September 19th, 2017: Dear Legend Oaks III Neighbors, The Association is pleased to announce that all street/stop signs have been cleaned and painted. As the weather cools, it will be a great time to do some fall clean up. Read more about this. Spring reminders March 15th, 2017: Spring is almost here and lawns everywhere are greening up . Plants and shrubs are sprouting out branches and flower beds are filling with weeds. Remember, your Association governing documents require each owner to keep their yards maintained, mowed, edged, weeded and trimmed. Take some time to refresh the beds with new mulch or pine straw. With ... Read more about this. Legend Oaks Plantation is a residential community on the outskirts of the historic Town of Summerville in Dorchester County, famous for its annual Azalea Festival. It is located 30 miles from Charleston near the end of the Ashley River Road Scenic Corridor. Ashley River Road is home to Drayton Hall, Magnolia Plantation, and Middleton Place, three of the loveliest remaining plantations open to the public in the Old South. The area is characterized by lovely old oak trees, some over 250 years old, and streams and wetlands that connect to both the Ashley and the Stono Rivers. Prior to development as a golf course community, the land was a working rice plantation. In the center of the community of over 600 homeowners, is the lovely 18 hole semi-private Legend Oaks Golf Club.Legend Oaks Plantation is the original subdivision developed around the Legend Oaks Plantation Golf Club. Willow Point and The Providence are also part of the community and are located on the north side of Route 61. Palmetto Forest subdivision off Route 165 and The Club subdivision on Route 61 are part of the greater Legend Oaks Community, but will have their own Homeowner’s Associations. Legend Oaks Golf Club at Legend Oaks Plantation has been voted one of the low country golfing community’s favorite courses. Once a working rice plantation, the 18 hole course was designed by Pete Dye associate Scot Poole III. The course is beautifully landscaped with 200+ year old oak trees and streams and wetlands connecting to the area river systems. In addition to a full service clubhouse, there is also a swimming pool and cabana plus 4 tennis courts, 2 with lights for night play. Information about golf or pool and tennis memberships and club tee times is available at 843.821.4077. Not too many developments have an elementary and a high school right next door, but we do! Beech Hill Elementary School Located right next to Legend Oaks, an easy bicycle ride from your house! Ashley Ridge High School It doesn’t get better than this, an elementary school next door, and a high school as well. Just opened in fall 2008, it is a state-of-the-art high school, and of course, very new. Approximately one mile from the south Legend Oaks entrance. Thirty minutes from Charleston on scenic Highway 61 and located on the site of a former rice plantation. Chosen by the readers of Charleston Business Journal as one of the Top Three Low Country Courses, Legend Oaks is genuine Low Country golf at it’s finest. Golf Magazine Travel Editor Brian McCallen likened the approach to the Legend Oaks plantation-style clubhouse, through an avenue of 300-year-old live oaks, to the drive up Magnolia Drive leading to Augusta National. “Though the golf course is more akin to Pinehurst no. 2 in its straightforward presentation of challenge,” McCallen added. 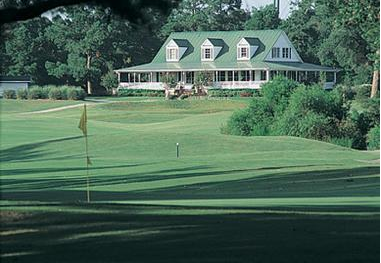 Legend Oaks Plantation is a classic layout, nestled in Charleston’s Historic Plantation area. Selected by Golf Styles Magazine in 2007 and 2006 as one of the Top 100 Courses in the Carolina’s…you must, Experience Golf Plantation Style at Legend Oaks!